Rich Snippets, you will have all come across them many times when searching the web, but the question is, have you noticed them? 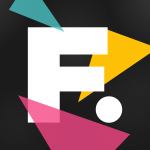 Whether you’re searching for the nearest fast food restaurant or the best place to take your partner at the weekend, Rich Snippets essentially do one thing – provide your search with the best visual and most relevant results. Rich Snippets were first introduced by Google in May 2009 which then led to other search engines following soon after. In recent years the variety of different types of Rich Snippets has hugely evolved. We have moved on from the days where Google were only supporting data for reviews. There are now many different types of Rich Snippets being displayed by Google which you almost certainly will have come across when entering a search query. Product availability, prices and reviews about a person or organisation are just some of the many Rich Snippets that are displayed by search engines today. 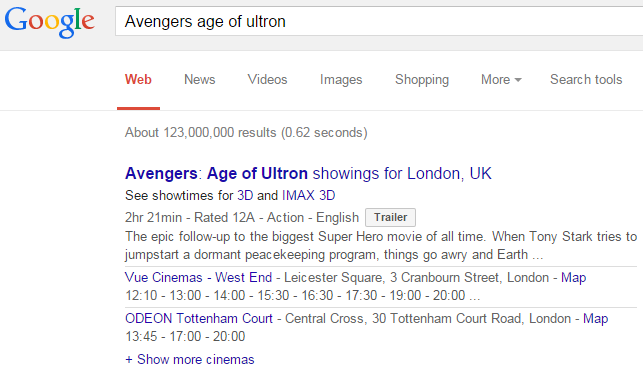 We have shown an example of this below with the film search ‘Avengers : Age of Ultron’ – you will see here that the results have pulled together times and cinema website links, with reference to our personal location – and it’s Rich Snippets that have enabled this personalised data to show in the results. If you’ve had the development of your website outsourced, then you’re most likely to be unaware if structured data markup has been implemented. In January this year, Google announced the update of their new Structured Data testing tool, making it easier to identify how Google interprets a web page’s structured data markup. By copying and pasting the URL in the “Fetch URL” text box, this will display any valid structured data code used on the page. For this process, the first thing to do is to identify which type of data would be valid. There are many ways to manage this; one option is to take a look at a collection of schemas provided at schema.org . Schemas are often used by webmasters to markup HTML pages and is a form of structured data. By manually looking at the available types of schema (e.g. Organisation, Person, Place and Review) you are able to identify which schema types could potentially be used. Google also offers a Structured Data Markup Helper tool, however, this tool does not list all data types in comparison to viewing Schema.org. Once you’ve decided on the data types that are valid for structured data markup, the next step is to choose the type of markup format to use. There are currently three different formats supported by Google. These are JSON-LD, RDFa and microdata. The latter is most preferable for Google. By implementing schema markup Product and Offer on valid data such as product name and price, Google could use this to feature a Rich Snippet providing an enhanced page listing such as the price of the product and its availability. This is most useful for ecommerce type sites, which could see the benefit in an increase of click-throughs from organic search. In using the schema markup such as Telephone, Email and Location on valid data, this can be a strong signal to Google’s algorithms to show which information is preferred, such as contact details or address, and where possible, influence the information provided on Google’s Knowledge Graph. 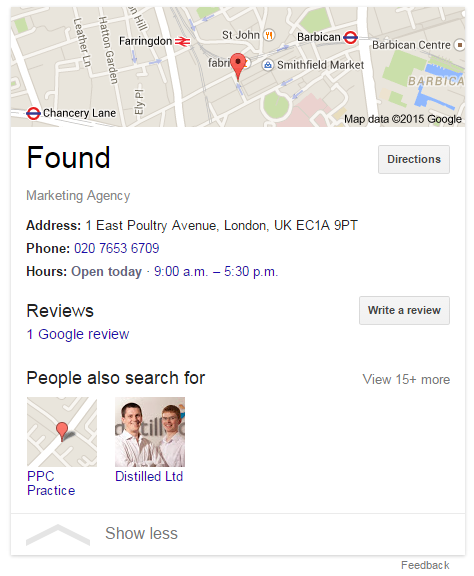 This type of page enhancement on Google is often associated with an organisation, product or service. Although this can positively affect a user from clicking through to a page from the organic search listing, this should be used with caution. In essence, if your site has a poor site review across most pages, this could negatively affect the chances of a user clicking through to your site. However, if there are a lot of positive reviews evident on the page, employing the schema markup aggregate rating could reap the benefit of the site receiving more click-throughs, and the possible chance of higher conversions as positive reviews are a trusted vouch. There are now a large number of social media platforms available on the web. Some of the benefits in having a social media profile for business is that it can help increase website traffic and build brand awareness. Websites that have a link to their social profiles can employ an organisation schema markup (Google offer advice here), which can be used and displayed within Google’s Knowledge Graph. Deciding on what data to markup can effectively improve your user’s experience and you may even see an increase in website traffic and the possibility of higher conversions. With any implemented strategy, it’s imperative to monitor the site’s performance before and after implementation. As with the “Site Review” example above, displaying positive reviews in the form of a Rich Snippet could have a positive effect, however, this could be a disadvantage later if many reviews turn negative. So it is always best to think about whether this is the right tactic for your business.